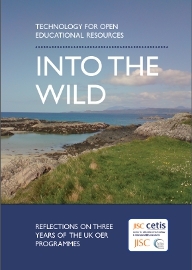 With great pleasure and more relief I can now announce the availability of Into the wild – technology for open educational resources, a book of our reflections on the technology involved in three years of the UK OER Programmes. Between 2009 and 2012 the Higher Education Funding Council funded a series of programmes to encourage higher education institutions in the UK to release existing educational content as Open Educational Resources. The HEFCE-funded UK OER Programme was run and managed by the JISC and the Higher Education Academy. The JISC CETIS “OER Technology Support Project” provided support for technical innovation across this programme. This book synthesises and reflects on the approaches taken and lessons learnt across the Programme and by the Support Project. This book is not intended as a beginners guide or a technical manual, instead it is an expert synthesis of the key technical issues arising from a national publicly-funded programme. It is intended for people working with technology to support the creation, management, dissemination and tracking of open educational resources, and particularly those who design digital infrastructure and services at institutional and national level. If you want glossy-covered paperback, then you can order it print-on-demand from Lulu (£3.36); if you’re not so fussed about the glossy cover and binding then there is a print-quality pdf you can print yourself. If you have an ePub reader you can download, there is a free download of an epub2 file. If you have a Kindle, you can download the .mobi file and transfer it, or if you prefer the convenience of Amazon’s distribution over whisper-net you can buy it from them (77p, they don’t seem to distribute for free unless you agree to give them exclusive rights for all electronic formats). finally, if you prefer your ebook reading as PDFs, there is one of those too. All varieties are free or at minimum cost for the distribution channel used; the content is cc-by licensed and editable versions are available if you wish to remix and fix what we’ve done. Available via the Cetis publications site. Earlier this week I was invited into a Further Education College to participate in a Technology Strategy working Group. I’m really very pleased to be invited to these kinds of discussions as I see them as crucial in informing both my work for JISC CETIS and the IEC Department in Bolton. Perhaps on the down side it is a often a (much needed) harsh reality check on the challenges faced by institutions in applying technologies and technology policy across their enterprise, not just in the teaching and Learning domain. I have previously “blogged” about, what I see as, often poorly informed and quite “Draconian” policies regarding internet usage within FE colleges including, for example the wholesale blocking of students’ internet access to social networking sites. It’s easy and too simplistic to suggest that this is resolved solely by increased knowledge amongst administrators, education, or by a more sophisticated understanding of ICT by those responsible for policy. There are major issues at the policy level, which Colleges are obliged to deal with. There is some discussion as to what level of technical understanding should senior Management in institutions have. Lawrie Phipps, JISC programme Manager “blogged” about this very subject earlier this week. And he raises some important issues and questions. What has prompted my current thinking on this situation are recent guidelines produced by Ofsted in structuring grades for College Assessment within the Leadership and Management effectiveness. Two of the criteria “Safeguarding” and “Equality and Diversity” are what are termed as Limiting grades; which in effect means should a college receive an “ineffective” grade on one of these criteria it is unlikely that overall effectiveness of the college would be assessed as anything but “inadequate” which in turn triggers a series of requirements of the college. Whilst these two criteria are clearly extremely important the emphasis of college’s maybe, understandably, concentrated on these criteria. Quality of provision, which falls within the teaching, learning, and Assessment criteria, could be compromised. Whilst Ofsted recognizes the need to equip students with the skills necessary to navigate the digital space safely; the balance is precarious. Clearly any college that blocks access to all sensitive sites and social networking sites is “effective” with its safeguarding policy but would, in my view, be quite inadequate with its teaching, Learning and assessment provision. The former however carries much greater weight.